Stepping outside on a cold, clear Hill Country night to gaze at the stars helps us escape the fast pace of our daily lives for a few precious minutes. However, growing urban sprawl and development can bring more than just air pollution — they bring “light pollution,” where unnecessary artificial light floods peaceful natural skies, making stargazing a thing of memory. Restoring the stars’ brilliance against an unpolluted sky can be accomplished through properly designed and installed outdoor lighting. Simple downlighting and shielding techniques can reduce glare, light trespass (light shining on other properties) and sky glow (hazy, amber or pink sky on cloudy nights) while improving safety, security and the enjoyment of property. Some urban areas in the Hill Country area have instituted outdoor lighting ordinances in an attempt to minimize light pollution, including the the City of San Antonio, Bexar and Comal Counties (near Camp Bullis), Johnson City, Blanco, Village of Wimberley, Helotes, Bulverde, West Lake Hills, Horseshoe Bay, Boerne, Dripping Springs, Mason, Fredericksburg, and Llano. However, Texas counties do not generally have the authority to pass ordinances for effective lighting for clearer night skies. See our County Authority page here for more information about county authority in the Hill Country. 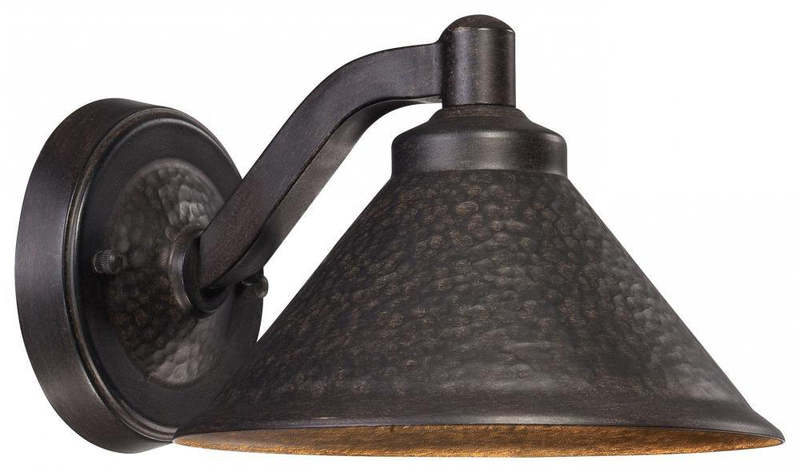 Looking for Dark Sky friendly light fixtures or shields? Buyer be ware, many fixtures on the market that are labeled as “Dark Sky” are actually not. We have sorted through the fixtures and shields offered by Home Depot and listed the truly Dark Sky friendly fixtures here. Or, you can go by the International Dark Sky Association’s Fixture Seal of Approval. When in doubt, look for fixtures that are fully aimed toward the ground with the light bulb completely shielded. If any part of the light bulb is visible below the shield, it is not a 100% dark sky friendly fixture. 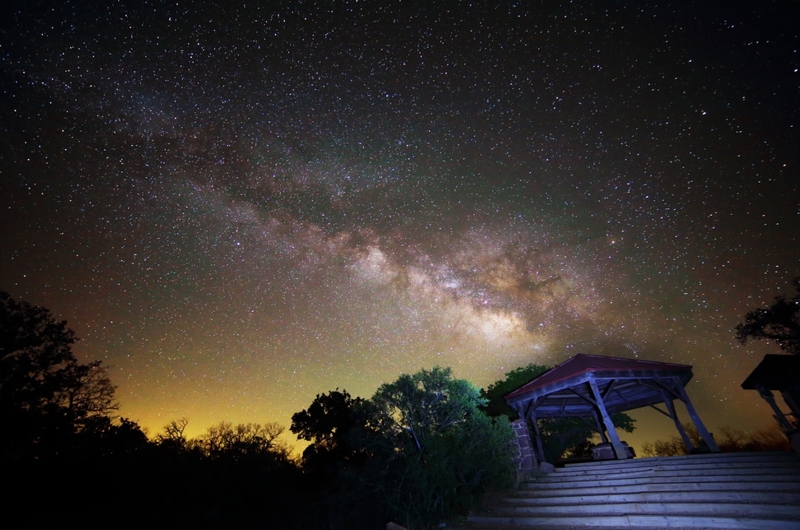 There is something magical about the starry night sky in the Hill Country. Stepping outside on a crisp clear night to gaze at the stars helps us escape from the fast pace of our daily lives and connect with the natural world around us. It is essential to ensure that our lovely night sky is not lost due to ever increasing light pollution. Are you ready to see more stars in your community? HCA’s Vice President, Matt Lara has created a wonderful, easy to give presentation about protecting the night sky with effective lighting. Contact HCA to schedule a program in your community. The Hill Country Night Skies map set is a set of 6 maps showing the night time light intensity of the Hill Country in 1992, 1995, 2000, and 2010. The final map shows the change in intensity from 1992 to 2010. The data was collected by the National Oceanic and Atmospheric Administration. 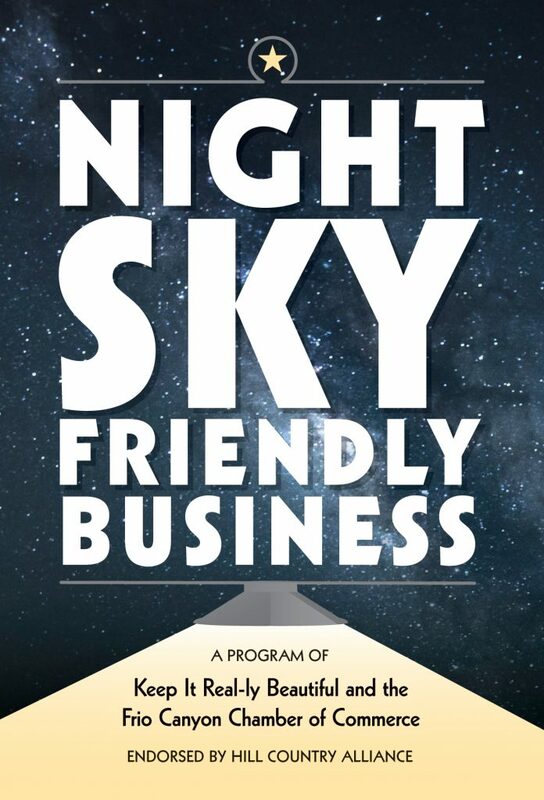 Learn more about the Night Sky Business Recognition Program and how you can bring it to your County. 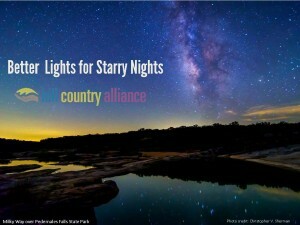 Join the Hill Country Night Stewards, a group of landowners, businesses and communities who have pledged their commitment to protecting the night skies. Outdoor Lighting Control: A Win-Win Situation!